With quite a few blogs on Thai cuisine on my site, it is hard to justify writing another one on this Southeast Asian cuisine. However, when I heard that there was a new restaurant not far from my neighborhood serving this Asian cuisine, I knew I had to check it out after getting over my initial surprise (“What? 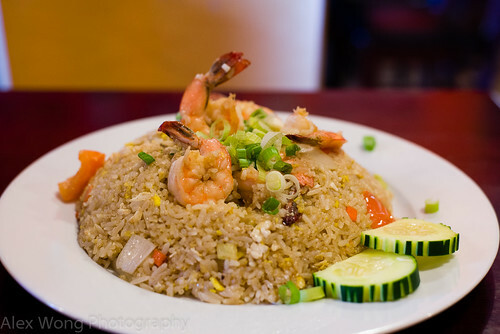 In Prince George’s county?”) Reading my previous blog on another Thai establishment (see blog), you sense my frustration that my county is not as “blessed” as the neighboring ones when it comes to international cuisine, especially Thai. Furthermore, it is located in the heart of College Park, MD (aka Party Town) which is known for mediocre cheap eats, drinking holes, and rambunctious fraternities – I graduated from there more than 20 years ago, so I know. With these thoughts in mind, I knew I had to check this new place out and see whether the positive online reviews (100% on one site) were written by reviewers in a sober state. 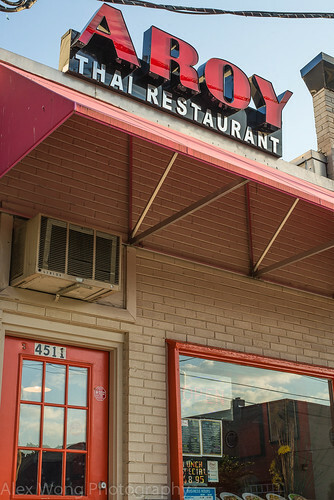 Located just off the main drag Route 1, Aroy is squeezed into a narrow building in a short block lined with metered parking on both sides of the street. The window is displayed with plastic rendition of their dishes that brings to mind Japanese sushi models popular in the 90’s. Walking into the narrow building, you notice that it is a small 7-table establishment with a counter separating the dining room from the kitchen. The bright orange walls and the long wood banquette makes the place welcoming and warm. Having a lifetime experience with this cuisine since I was a child, I recognized many dishes on the menu and I decided to check-out their offerings by ordering some standard dishes. 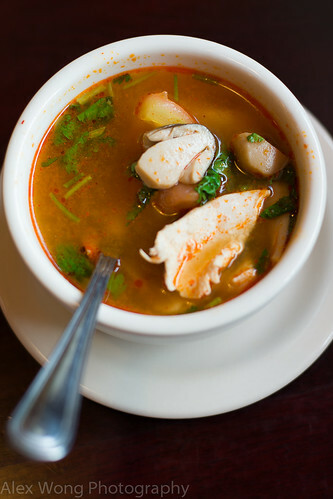 As part of their lunch menu, the main dishes come with Thai Spring Rolls or Tom Yum Chicken Soup. I must say I did not expect much from these appetizers since they were part of the lunch deal, but I was proven wrong. 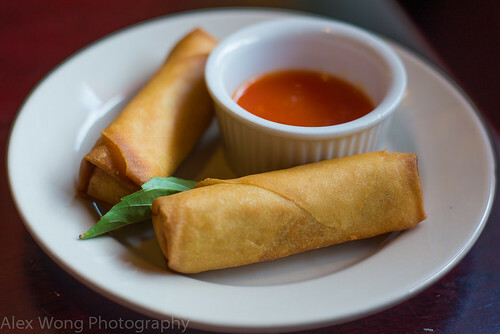 The spring rolls were crispy and nearly greaseless, light from the thin wrapper, and delicious from a filling made with bean thread noodle, fine cabbage, and a surprisingly flavorful ingredient, oaky shiitake mushrooms, which elevated these bites to another level beyond its pedestrian flavor. The soup was unexpected for me also. Instead of an insipid sip, it was flavor packed with aromatics like lemongrass, and balanced with enough chili heat, lime tartness, fish sauce saltiness, and sweet from a pinch of sugar. The bowl had a fair amount of mushrooms, tomatoes, and slivers of chicken breast to make it quite satisfying. A good start to the meal, indeed. On a couple of occasions, I decided to try out their traditional salads. 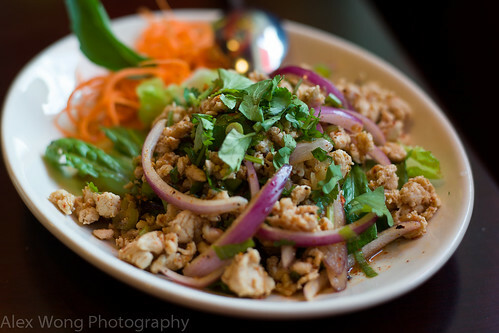 The first was Larb Gai. Pieces of minced chicken are paired with sweet onions, roasted chili powder, toasted rice powder, and moistened with lime juice, fish sauce, and a hint of sugar. This was a delicious spicy salad with the chili powder and rice powder adding a level of smokiness and heat to the sour, salty and sweet flavors of this warm bite. If it weren’t for a couple of sinewy pieces of chicken, this would have been flawless. 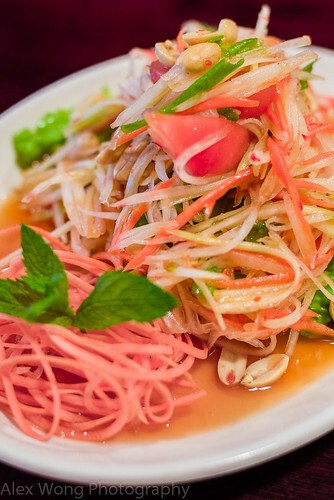 The other salad was Som Tum, or Green Papaya Salad. Thin julienned strands of the young fruit are paired with carrot, tomato, and green beans, flavored by a sauce made of fish sauce, lime juice, and fresh chilies. What I enjoyed about the dish is the freshness of the ingredients and the balance of the bold flavors as well as the assertive spice heat – the kitchen is not holding back here. The whole peanuts in the dish added a rich nuttiness that balanced out some of the acidity in the dish. This was refreshing for me despite the fieriness of the chili heat – definitely, very close to Ped (Thai chili hot). 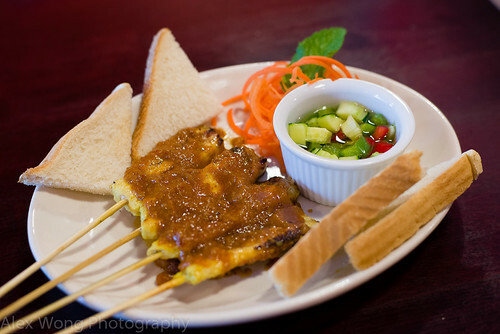 Another appetizer that is a good litmus test of a Thai kitchen is its rendition of Sate Chicken. This restaurant’s version was out of the ordinary and it definitely wowed me. Unlike many versions that I have eaten before, here the pieces of chicken were well marinated in turmeric and root aromatics like galangal making each moist piece full of flavor and aromatic, enough to stand by itself. The accompanying sauce was also revelatory. Most restaurants serve a bland version made with peanut butter but here, I tasted a version made with crushed peanuts, root aromatics, palm sugar as the sweetener, and tamarind juice as the sour element, an authentic sauce that I have tasted on the other side of the world. The toasted pieces of bread were the perfect vehicle to mop up the sauce to its last drop. The bowl of sweet pickles was probably a bit too fresh and they could have done with a longer pickling. But that was very minor compared to the main players of this opening dish. Yummm! 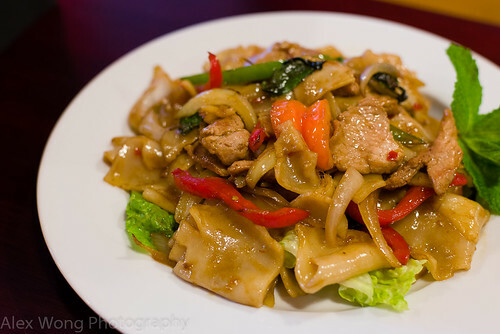 Noodle dishes seem to be calling my name every time I visit a Thai restaurant and I had to sample their offerings. A friend’s order of Pad See Euw was his lunch on one occasion. The wide pieces of rice noodles were slightly bouncy fresh and adequately sauced without being drowned by it, tasting savory from Thai soy and quite sweet that made each bite irresistible. The crunchy broccoli, moist chicken slices, and wispy clouds of egg added the necessary tasty elements to the dish, which made this version pleasurable for my friend. 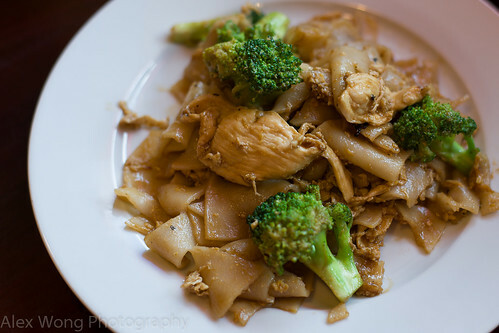 My order of Pad Kee Mao, or Drunken Noodle, was totally up my alley. The wide noodles were fresh and not oily, adequately covered by a savory sauce (which remains a secret enigma to me to this day), mixed with slightly crunchy sweet peppers and onion strips, fragrant fresh purple basil, biting fresh bird chilies, moist meat, and pieces of sweet tomato. This was an damn good version of my favorite Thai noodle dish, and it hit the right spots for me. Very few fried rice dishes impress me these days but my friend’s order here was something else. The fresh tasting rice was cooked with bits of slightly crunchy carrot bits, sweet white onions, juicy tomato, topped with perfectly cooked shrimp, pungent green onions, bits of scrambled eggs, and served with fresh cucumber slices. But what ties these disparate elements together is the flavoring added to the mixture, made from Thai soy sauce, containing a je-ne-sai-quoi added to regular soy, and a hint of fish sauce. Despite being engrossed in my delicious noodle dish I couldn’t help but spoon from his rice place and enjoy the flavor profile of this dish. When it is done right, this dish sings in the mouth, and it did in this case. No meal in a Thai restaurant would be complete without ordering a curry dish, or a couple of them. 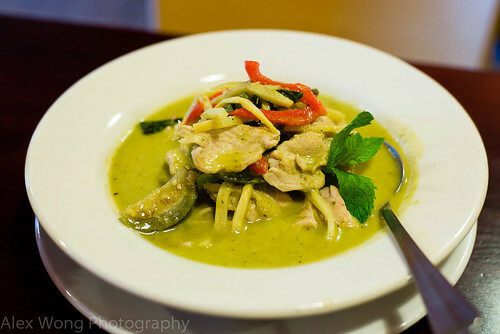 On one visit, I ordered the Green Curry. My bowl arrived with lean pork, Thai eggplant, bamboo shoots, sweet peppers, and purple basil. Being a curry dish, the main player is the curry sauce, and this version was outstanding for me. It had a slight peppery quality with a vegetal green chili fragrance, made more aromatic with root herbs and the basil. But the cooking of the curry paste with fresh tasting coconut milk resulted in a well amalgamated mixture that stands out from other versions. It was slightly sweet which points to the Thai sensibility for this seasoning as integral to the authentic palate. Another visit’s order of the Red Curry was equally superb with the same ingredients as the above dish with exception of the curry paste. The sauce was a bit more fiery with the use of red chilies in the paste with a darker leaf aroma from the use of Kaffir lime leaf – the evidence of a soften leaf points to adequate cooking to render all its flavor into the sauce. I was again impressed by the skillful cooking that gave the curry a magical quality that I have not experienced often with this dish. Although the sweet offerings here are sparse, I had to give them a try since they were some of my favorites. The Fried Bananas came as mini spring rolls stuffed with pieces of banana, and topped with some honey and toasted sesame seeds. The dough was fried crispy and nearly greaseless, encasing a filling of soft sweet banana, made even sweeter by the honey and fragrant from the sesame seeds. 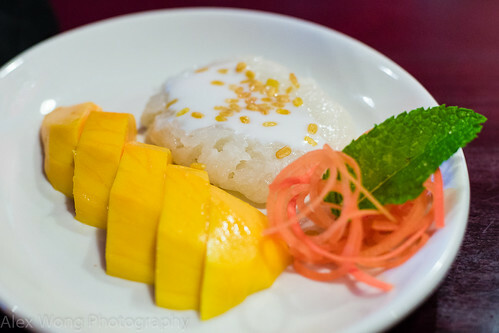 An order of Mango and Sticky Rice was a special on another visit. After getting a confirmation from the cook that the mangoes were prime and sweet, I received a plate with pieces in such heavenly state. The side of sticky glutinous rice topped with coconut cream was an equal partner to the ripe fruit. It had enough saltiness to match the sweet fruit and rich from some quality coconut crème made nutty from a topping of fried mung beans, an addition that wavers from the usual sesame seeds. What impressed me the most of this dish was the rice, which was perfectly cooked and matched in seasoning and creaminess. I know how tricky it is to cook this grain well, and that is why most restaurants can’t get it right. However, this is the best rendition (yes!) of this dessert I have ever tasted, and its delicious ghost aftertaste still haunts my taste buds. Alex. I am so delighted you discovered (and helped promote) this well deserving gem. As I work in the UMD Research Park across campus, I, too, am on the search, usually to my disappointment, for something other than Subway near campus. I am familiar with the term “aroy”, as it is well used, and abused, in much the same way that Saigon is for Vietnamese restaurants. But it is more than appropriate here. So wonderful to see this family owned establishment in the heart of P.G. and wish I could see more. I adore the very small, quiet and quaint setting. I truly feel as if I am sitting in her dining room as she rolls out the delicacies. Might I recommend a Vietnamese favorite while I am on the subject? VN Noodle on Rt. 3 in Crofton is a favorite. Again, family owned, I have found it difficult to go elsewhere. A bit of a hike, I know, for you, but I would be curious as to your take on this. Rogers, thanks for your comment and for concurring about this wonderful gem of a place. I’m looking forward to good Thai food near my house. I will definitely check out your recommendation of the Vietnamese place since you led me to Woodlands before. 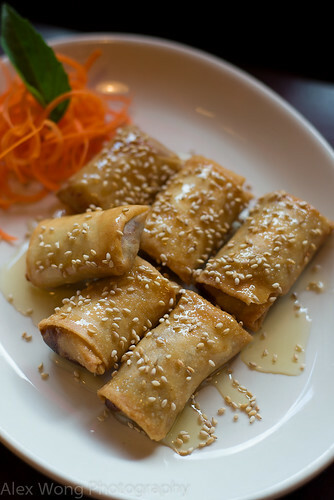 Have you tried Viet Huong? It is real good. No, i have not had the chance. I used to work in Roslyn, so I miss that proximity to “Little Saigon” along Wilson Blvd. I grant you that Arlington and Georgetown are unsurpassed with respect to Vietnamese. However, VN Noodle does come somewhat close. They are family owned and operated, literally by the mother, the son and the sister, and various assortments of relatives who assist. This, in a sense, also limits them to some degree, so I would be curious about your feed back. I discovered Aroy Thai last winter, by accident, when I was returning an item to the Book Exchange. Usually the way I discover these out of the way places. Another national cuisine that I yearn for is Indonesian. There were plenty in San Francisco that I discovered when I traveled there for work. An Indonesian friend who was here on a fellowship and Fulbright Scholarship in 2009 introduced me to several in New York. Alas, not in Maryland, although I am aware of a couple, again, in NOVA. All the best, and let me know if you wish to catch lunch at Aroy some day and swap “foodie” stories. BTW, I will be in Portland, OR in two weeks for a meeting. I have been before, but did not have time to really explore, so I will attempt to do some detective work on this outing. Yes, some of the best Malaysian/Indonesian eateries in hole-in-a-wall place in NYC. I would love to join you for a meal when I’m back from my travels in a month. Ttyl. 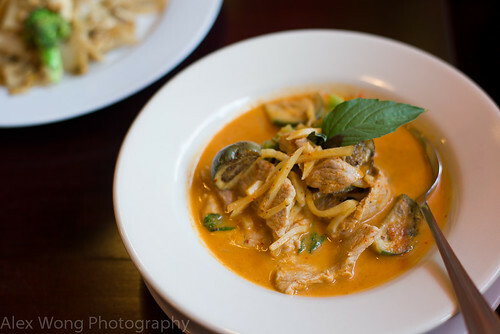 I’m reblogging this since Aroy Thai is offering a 3-course dinner for $15 during the week Aug 11th – 17th as part of College Park Restaurant Week, . This is a great tasty deal!